Home Costs > How Much Does Patio Furniture Cost? How Much Does Patio Furniture Cost? A patio set can be a perfect accent to your home, especially in the summer season. There are many different types of patio sets, including dining tables and chairs and couches. The type of patio furniture you purchase depends on the size of the area as well as your purpose in buying furniture for the area. How much are patio furniture prices? A bistro set, for example, will cost $90 to $250. This price will depend on the brand, the material, and the size and weight. For example, a bistro set by Savoy will cost about $100 while one from Strathwood will cost about $230. A lounge chair for your patio, one that is usually capable of reclining or rocking, can cost as little as $30 or as much as $300. Some of these chairs are sold in sets, such as the Strathwood Gibranta priced at $160 for two. Other chairs come individually, such as the Living Accents Adirondack chair for $40 or the Strathwood Hardwood Chaise Lounge for $120. A dining set for your patio can cost $200 to $2,500. The price difference is due to the manufacturer, the material used, the size of the table, the number of chairs, and any other features it may have, such as an umbrella and stand. On the low end of the price spectrum lies the Bromley set sold by Target for $200. In the middle lies the Cascade set, also sold by Target, for about $1000. At the high end lies the Mississippi 9-piece dining set sold for $2575. While there are many dining room sets that cost more, the average price of a dining set is about $600. A set of patio furniture including a couch, chair, and side tables (much like living room furniture), will cost $400 to $2000. The reason for this large price range is the same as it is for dining room sets. A patio set from Saratoga may cost around $400 while a set from Ohana will cost about $2000. Bistro sets usually come with one small table and two matching chairs. A dining set usually comes with a table and 4 to 6 chairs. Some more expensive sets can come with 8 chairs. Some sets also come with an umbrella and stand to shade you from the sun. 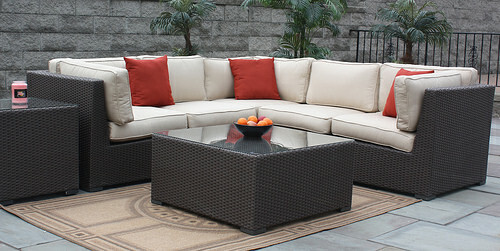 A patio set can include 3-12 pieces; for example, 2 chairs and one table or a chair, and couch, and 2 tables, etc. Depending on where you purchase your patio set, delivery and set-up may be an extra fee. Although most patio furniture is advertised as “all-weather,” you will want to protect your furniture from the rough winter season. Covers for your furniture can be bought or you can store your furniture in a storage facility. Tarps and tie straps also do the job if used correctly. The cost of refinishing patio furniture in the future, if you decide to do so, can cost anywhere from as little as $45 to $400+ per piece. The refinishing cost will depend on the quality of the strip and professional doing it. Powder coating patio furniture can cost $25 to $150, depending on the item being done. Usually, the larger the item is, the more it’s going to cost. Patio furniture cushions can tend to fade or rip over time. If you decide to replace them, each cushion can cost $20 to $40 each. While it may be tempting to purchase online, try the patio set out in person. You may find the cushion may not be as comfortable as you think. It’s also best to measure your space ahead of time to make sure the furniture will fit. Since this furniture will be outside most of the time, try to stick to sets made from teak, metal or cedar as these materials tend to hold up better. Consider storage for your furniture to add more years to its life. If you don’t have the space to store it, consider purchasing a set that can be folded down. Because patio furniture is seasonal, most stores will have it on sale at the end of the season, which tends to be July and August in most place. Watch your local advertisements for sales. Used patio furniture can be bought through services such as Amazon, eBay, and Craigslist. It also doesn’t hurt to browse local garage sales. Be careful what you purchase. While the cheaper plastic sets will look good on the shelf, these sets often don’t last more than two years.